On Jan. 15, the New Mexico State Police seized 391 pounds of marijuana out of a car hauler carrying two SUVs at the Gallup port of entry. 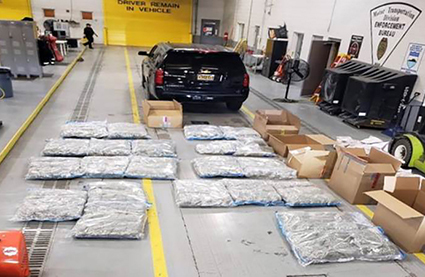 The very next day, two men were arrested at the same port of entry when NMSP officers found 381 pounds of marijuana and 183 pounds of drug paraphernalia in a commercial motor vehicle (CMV). While officers conducted a safety inspection on the CMV, they observed 14 large boxes and could smell a strong odor of marijuana coming from the trailer. Officers found 299 bags of marijuana, cannabis vape oil, and loaded dispensers. The driver, Eaid Gheith, 26, of Justice, Ill., and the passenger, Cemil Durgut, 30, of Bridgeview, Ill., were both arrested and booked into the Gallup-McKinley County Detention Center. • Attempting to commit felony distribution of marijuana or synthetic cannabinoids (over 100 pounds), a third-degree felony. • Conspiracy to commit distribution of marijuana or synthetic cannabinoids (over 100 pounds), a fourth-degree felony. • Delivery or manufacture of drug paraphernalia, a misdemeanor.